President Trump and White House officials have repeatedly made clear they expect every federal agency in government to slash its workforce. The Defense Department, however, is going its own way. The largest federal agency said in a recent business plan that while other agencies may need to cut employees, it would instead grow its civilian workforce. 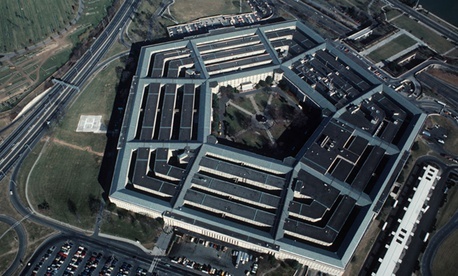 The Pentagon said the plan served as its implementation of the Office of Management and Budget’s memorandum calling on all agencies to develop plans for reducing their rolls, which itself stemmed from a Trump executive order. The business plan, which was led by Chief Management Officer John Gibson, was first reported by Federal News Radio. The Pentagon has sent OMB a “workforce rationalization plan” in response to the White House office’s mandate for reform proposals, which it said marks a “significant shift” in its approach to “workforce sizing, shaping and structuring.” It will move away from placing “arbitrary caps” on civilian staffing levels and instead depend more on those employees over “needlessly expensive” contractors and borrowing military personnel. Under an initiative established during the Obama administration, Defense headquarters offices sought to slash 25 percent of their employees. The department cut 40,000 civilian employees between fiscal years 2012 and 2015, a 3.2 percent reduction. The Pentagon extended Trump's governmentwide hiring freeze by several weeks last year, and only lifted it after issuing guidance that it would carefully assess the "necessity and prudence" of filling all vacancies. Defense said its plan would reduce costs by cutting contractor services, instead “in-sourcing” that work to the government. The department plans to analyze positions to determine if they can be converted to a lower grade or from military to civilian, as well to reduce management layers across the organization. Matt Biggs, legislative director for the International Federation of Professional and Technical Engineers, which represents more than 10,000 Defense civilians, called the plan "very positive" and "a long-time coming." "They're recommending what's obvious," Biggs said. He cautioned, however, about the potential for the department to use the plan to boost contractor hiring: "The devil is in the details there." The American Federation of Government Employees also cited concerns about contractor spending, and said the business plan alone will not be sufficient to alleviate issues with civilian hiring. “While it’s certainly good news that the Pentagon has formally recognized civilian employees as essential to readiness, lethality and sustainment of the all-volunteer force of military," the union said, "the reality is that a single Pentagon headquarters policy by itself, practically speaking, does little to end the longstanding caps on hiring permanent civilian employees." The department will use special hiring authorities it recently received to improve recruiting efforts. The Office of the Undersecretary for Personnel and Readiness, currently headed up by Veterans Affairs Department Secretary-designate Robert Wilkie, is implementing a plan to ensure the effectiveness of those authorities and to prepare human resources specialists in the field to use them. Defense is also elevating the chief management officer position and tasking him with leading a “reform management group” to oversee any structural changes identified to make the department’s operations more efficient. “The creativity and talent of the military and civilian workforce is our greatest enduring strength, and one we do not take for granted,” the department said. The department’s plans could conflict with congressional pressure; lawmakers appear to continue to support civilian staffing cuts. The House recently backed a provision in the Fiscal 2019 National Defense Authorization Act that would require the Pentagon to slash its departmentwide back office functions, such as logistics, human resources, service contracts and real property management, by 25 percent. The measure has yet to receive a vote on the Senate floor. Trump has proposed boosting Defense’s civilian workforce in each of his first two budget proposals. Defense declined to comment for this story in time for publication.